Continuity mistake: In the scene where Ashley says that they've got CDs in the tanning salon you can see Ashlyn keeping a cream tube on the table with her right hand. In the next shot you see her continuing the same action with the left hand. Deliberate mistake: There are a number of things wrong with the roller coaster scene (besides the obvious impossibility of a crash like this actually occurring):1) The restraints use ratchets to lock, not hydraulics. A coaster of this type wouldn't even have any hydraulic lines.2) No roller coaster has restraints that lower by themselves.3) The attendants didn't check all the restraints. This is ALWAYS necessary, on ANY ride.4) On any roller coaster, the Dispatch button (or "Start" in the movie) must be held down until the train is clear of the station. This is a safety feature to make sure the attendants are clear of the moving train. If the button is released before the train is clear of the station, it will stop.5) At the bottom of the lift, the lift chain curves to follow the track into the station. This is impossible, a lift chain cannot curve horizontally, only vertically (normally at the top of the hill). 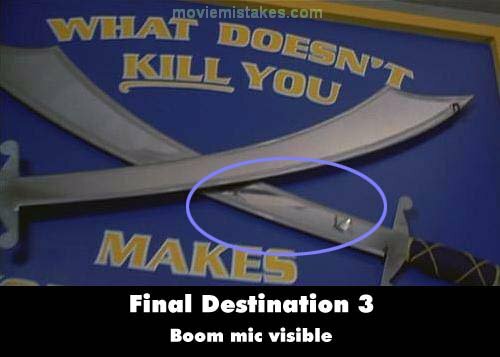 Visible crew/equipment: In several shots during the weight room scene, a boom mic is reflected in the hanging swords. Continuity mistake: In the scene where Kevin and Wendy are talking outside of the school, Kevin's hair change positions depending on the shot. At the same time, each time the shot goes back to Kevin, not only does his hair change, but the people behind him. It switches from Julie and Perry to random people, then back again. 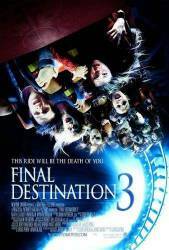 Revealing mistake: The roller coaster used for the Devil's Flight is really the Corkscrew at Playland in Vancouver, where all three movies were filmed. If you look during the opening credits, you can see the name "Corkscrew" up in the lights above the coaster. After this, it says Devil's Flight during the rest of the roller coaster scenes. Continuity mistake: The position that Ian holds his nailgun changes between shots. Visible crew/equipment: When both Kevin And Wendy are looking at the pictures after the funeral, Kevin asks Wendy to look at Frankies picture. Kevin then turns the car a little to the left almost hitting the tow truck, seen in the metal bumper you can see the front of the camera truck. Factual error: A cordless nailgun takes about 2 seconds to recharge and cannot fire consecutive nails nearly as fast as depicted. Continuity mistake: At the end of the scene where Ashley and Ashlyn are burning in the tan beds, one of them looks out of the side of their tan bed. This is supposed to be Ashlyn, but she's facing the wrong way, which means she would have to be in the tanning bed she didn't get into to make this shot right. Factual error: The main character states that the photo plate of Lincoln has a crack in the precise location he was shot. Lincoln was shot behind his lower left ear and the bullet ended up behind his right temple. This is not the path shown in the picture. Continuity mistake: During the scene when Wendy is looking at her camera and Julie walks in to ask if its ready yet, you can see Wendy holding the paper with Ashley's number on it. Then when Julie walks out, Wendy turns and sees the paper on her desk, no where near her hand. Continuity mistake: When the coaster passes Wendy on the right side, her hair blows on the left side. Other mistake: When Wendy and Kevin are grabbing lunch, just before Frankie Cheeks dies, the guy asks to take their orders (via the microphone) Wendy and Kevin never reply throughout the rest of the scene, and they are at the restaurant for at least another 2-3 minutes (during the whole of Frankie's death sequence) The guy working at the restaurant must be extremely patient not to ask for their orders again. Continuity mistake: Wendy's hair in the cemetery scene changes between shots. Revealing mistake: At the end of the film where Wendy is stuck on the track, she looks back at everybody that died. At the right side of the screen, right in front of the camera, you can see a dead girl blink. Deliberate mistake: During Wendy's roller-coaster premonition, you'll see a shot of Ian and Erin. The two girls behind Ian and Erin are supposed to be Julie and Perry, but are obviously stand-ins, considering they look nothing like the two actresses. Continuity mistake: When Ashley is panicking in the tanning salon, her ear piece keeps moving. Continuity mistake: During Frankie's death, right after the shot of Wendy and Kevin escaping, there is a very quick shot where Frankie is not in his car.